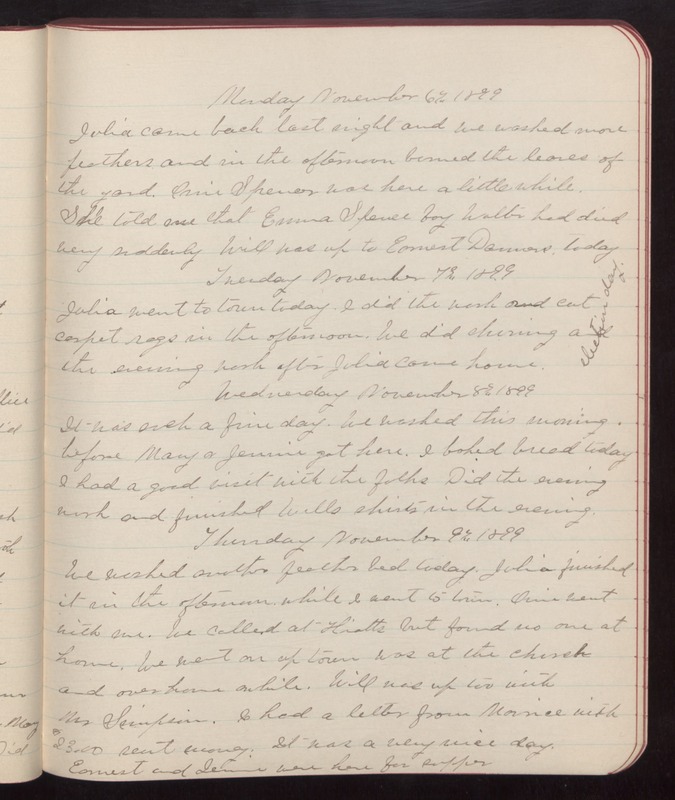 Monday November 6th 1899 Julia came back last night and we washed more feathers and in the afternoon burned the leaves of the yard. Ossie Spencer was here a little while. She told me that Emma Spence boy Walter had died very suddenly Will was up to Ernest Danvers today Tuesday November 7th 1899 Julia went to town today. I did the work and cut carpet rags in the afternoon. We did churning and the evening work after Julia came home. election day. Wednesday November 8th 1899 It was such a fine day. We washed this morning before Mary & Jennie got here. I baked bread today I had a gook visit with the folks Did the evening work and finished Wills shirts in the evening. Thursday November 9th 1899 We washed another feather bed today. Julia finished it in the afternoon while I went to town. [Ossie] went with me. We called at Hiatts but found no one at home. We went on up town was at the church and over home awhile. Will was up too with Mr Simpson. I had a letter from Maurice with $23.00 rent money. It was a very nice day. Earnest and Jennie were here for supper.